"It's a little too quiet in here, gives me the willies." 20th Century Fox has unveiled an entertaining second trailer for Drew Goddard's Bad Times at the El Royale, a killer new ensemble thriller from the director of The Cabin in the Woods. The film tells the story of seven strangers who meet at Lake Tahoe's El Royale. Over the course of one fateful night, secrets are unearthed, and everyone will have a last shot at redemption before everything goes to hell. The delicious ensemble cast of El Royale includes Jeff Bridges, Cynthia Erivo, Dakota Johnson, Jon Hamm, Cailee Spaeny, Lewis Pullman, Nick Offerman, and Chris Hemsworth. The first trailer was awesome, but this is even better. There's so much crazy stuff going on in this, and I still don't even know what's happening, but it looks amazing. I'm very excited for this, hoping for something special. The cast is aces, and the script seems original & twisted. Dig that "get the whiskey" line. You can still catch the first trailer for Bad Times at the El Royale here, to watch more footage from this. Seven strangers, each with a secret to bury, meet at Lake Tahoe's El Royale, a rundown hotel with a dark past. Over the course of one fateful night, everyone will have a last shot at redemption… before everything goes to hell. Bad Times at the El Royale is both written and directed by American filmmaker Drew Goddard, director of the film The Cabin in the Woods previously; writer of the films Cloverfield, The Cabin in the Woods, World War Z, and The Martian previously. He has also produced a few TV series including "Lost", "Daredevil", "The Defenders", and "The Good Place". 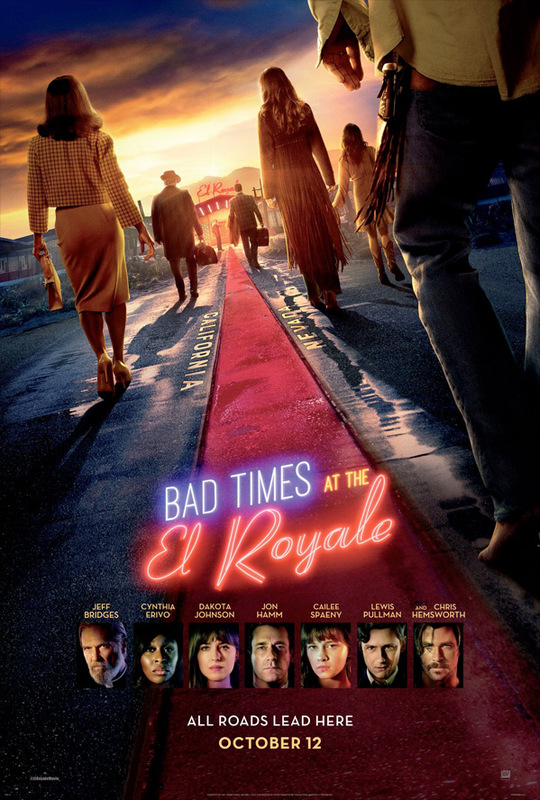 20th Century Fox will release Goddard's Bad Times at the El Royale in theaters everywhere starting October 5th this fall. Going to see this in theaters?